Few factors in the genesis of the occlusive type of stroke lend themselves to quantitive assessment. The most critical factors are tissue oxygen availability(tO2) and regional cerebral blood flow (rCBF). These are critically related by the fact that tissue O2 availability is proportional to the product of arterial PO2 (aPO2) and CBF. (27) Only in animals or under special surgical conditions in man can tO2 be measured or approximated. 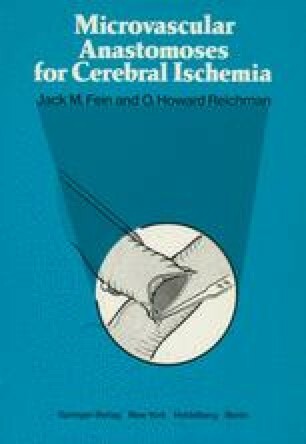 (2,10) However, rCBF can be quantitated in stroke-type patients, by noninvasive techniques. The original work of Kety and Schmidt in 1946 first showed that mean CBF could be quantitated in man by the application of the Fick equation and the inhalation of certain gaseous indicators. (21,23) They originally used nitrous oxide and more recently, radioisotopes have been used. (16,18,19,22) Originally, radioisotopes were injected into the internal carotid artery and the radioactive decay was measured over regions of the head and brain. This represents clearance of isotope by blood flow. Since recirculation of isotope was negligible by this technique, a simple exponential equation resulted for each of two compartments (fast and slow, or gray and white matter).